Defence Connect can confirm that while Defence Minister Christopher Pyne and Defence Industry Minister Steven Ciobo have announced the selection of the General Atomics MQ-9 Reaper variant as Australia’s armed UAS of choice, broader questions remain. Minister Pyne said the medium-altitude long-endurance (MALE) aircraft can be integrated within the Australian Defence Force and would be fully interoperable with the nation's allies. The General Atomics MQ-9 Reaper is a series of armed, unmanned aerial systems that has a number of variants, each modified for specific tasks and operational requirements, with a firm decision on Australia's variant still to be confirmed. 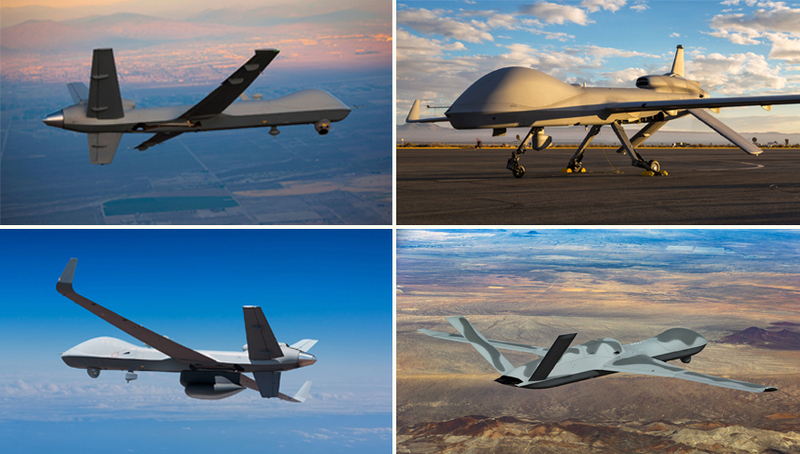 Predator B/Reaper: An evolution of the original General Atomics MQ-1 Predator, the enlarged MQ-9 has a number of operation improvements over the older system. According to the US Air Force, MQ-9 is capable of carrying fifteen times the payload of the original MQ-1 Predator and is is designed to go after time-sensitive targets with persistence and precision, and destroy or disable those targets with 500-pound (226-kilogram) bombs and Hellfire missiles. Gray Eagle: Another evolution of the combat-proven Predator, the Gray Eagle offers a reliable, affordable, low-risk, and compelling next-generation tactical UAS solution to meet challenging service requirements for persistent reconnaissance, surveillance, and target acquisition (RSTA) and attack operations. Gray Eagle has an endurance of 25 hours, speeds up to 167 knots, can operate up to 29,000 feet, and carries 488 kilograms of internal and external payload. The aircraft can carry multiple payloads aloft, including electro-optical/infrared (EO/IR) with laser designation, synthetic aperture radar (SAR), communications relay, and four Hellfire missiles. Gray Eagle - Extended Ranger (ER): An advanced variant of the Gray Eagle, the ER design delivers long-endurance UAS surveillance, communications relay, and weapons delivery missions in support of the warfighter. The ER variant is designed to carry an additional 204 kilograms of fuel over the standard Gray Eagle variant, allowing for a maximum endurance of 42 hours. Use of this extra fuel supports persistent RSTA missions. Predator C/Avenger: The most advanced variant of the Predator/Reaper family of armed UAS, the Avenger provides a number of capability improvements over the preceding variants, including a high-speed jet engine designed by Pratt & Whitney, while the aircraft's significant wing hardpoint payload mounting capacity enables it to carry multiple sensors, while its internal weapons bay can house 1,360 kilograms of precision munitions or larger sensor payloads. "Medium-altitude, long-endurance, remotely piloted aircraft have a far greater range than smaller remotely piloted aircraft and can continuously observe an area of interest for much longer than manned reconnaissance aircraft," Minister Pyne said. Critically, each of the Reaper variants are operated from a common ground control station and are air-transportable by RAAF C-130 Hercules and C-17 Globemaster airlifters, or independently deployable, providing deployed Australian forces with a highly capable, reliable and persistent close-air-support, intelligence, surveillance and reconnaissance asset, no matter the variant chosen. "The aircraft will be operated under the same laws of armed conflict, international human rights law and rules of engagement as manned aircraft," Minister Pyne said. General Atomics Aeronautical Systems (GA-ASI) said, the ADF joins other top-tier military forces in choosing a MQ-9 variant because of its proven multi-role combat performance. Known as the 'operators' choice, the MQ-9 is part of GA-ASI’s Predator series of RPAS, which is the world’s most trusted and capable armed MALE remote piloted aerial system (RPAS), and hails from a family of RPAS which recently surpassed five million flight hours. GA-ASI announced its intention to offer a MALE RPAS to the ADF during AVALON 2017 – the Australian International Aerospace and Defence Exposition – with the launch of Team Reaper Australia, a robust grouping of Australian industry partners. Linden Blue, CEO of GA-ASI said, "We’ll work closely with Team Reaper Australia partners to provide a highly capable and affordable RPAS to the ADF, while creating meaningful and enduring Australian jobs." The team currently consists of ten Australian companies providing a range of innovative sensor, communication, manufacturing and life-cycle support capabilities that includes Cobham, CAE, Raytheon, Flight Data Systems, TAE Aerospace, Quickstep, AirSpeed, Rockwell Collins Australia, Ultra, and SentientVision. Defence Industry Minister, Steven Ciobo said the project provides opportunities for Australian industry with associated infrastructure development and sustainment activities. "General Atomics, as the original equipment manufacturer of the Reaper, has partnered with a large number of Australian companies who provide a range of innovative sensor, communication, manufacturing and life cycle support capabilities," Minister Ciobo explained. General Atomics Aeronautical Systems, an affiliate of privately-held General Atomics, is a leading manufacturer of remotely piloted aircraft systems, radars and electro-optic and related mission systems solutions.